Here I am cooking our beautiful South Island blue cod again. Firm fleshed, white, delicate, delicious, locally and sustainably fished, there is nothing not to love about this fish. I spoke very briefly the other day to local seafood expert, restauranteur and chef Darren Lovell of Queenstowns amazing Fishbone Bar and Grill, about sustainably fished New Zealand seafood. I was heartened to take away from our conversation, the fact that he felt we had a lot to be proud of in our New Zealand fishing industry, and the work that is happening to ensure the long term sustainability of our fisheries. Comments like this from informed people are great to hear, and it is always a conversation worth having regarding anything we choose to eat. 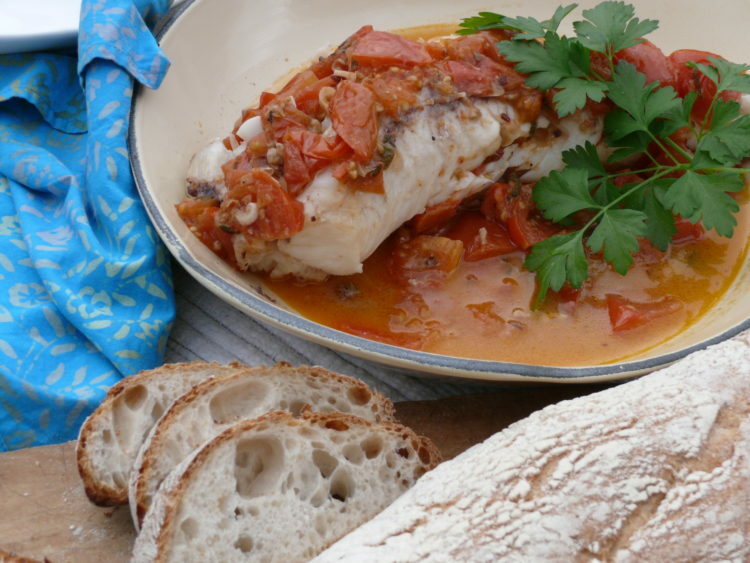 The phrase ‘crazy water’ in the title of this recipe- is from the Italian aqua pazza, which in translation may refer to the simple tomato, garlic herb and chilli broth, or to the sea water that the fishermen use to cook there catch – there seems to be no definitive answer to this. It is though, a very alluring title and one that drew me to it straight away. The beauty in this dish lies in its simplicity and the integrity of the ingredients. 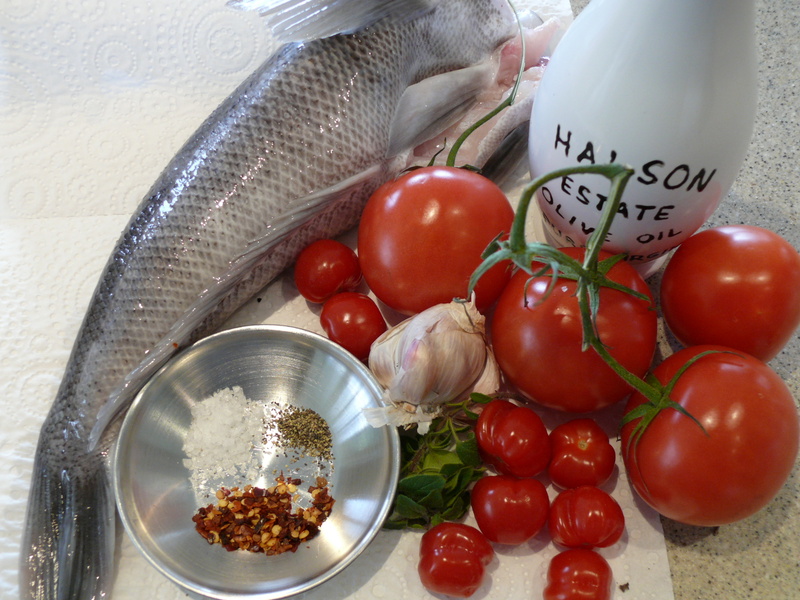 Show casing fresh fish with the best tomatoes you can find, a few fresh herbs, garlic, chilli flakes and your best extra virgin olive oil. It is often simple meals like this that show off the best of any countries real – everyday – good food. 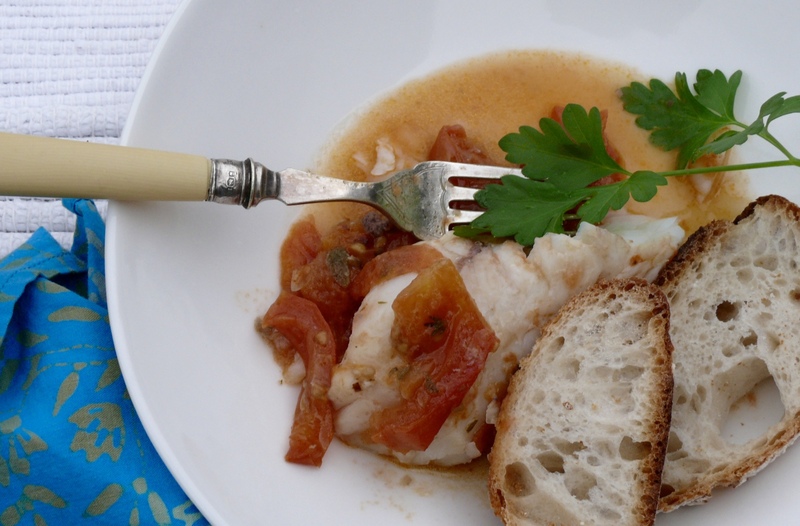 You could use this recipe with any fresh white fish and serve it with some crusty bread or baby potatoes, simple but sophisticated at the same time. To begin you will need a pan large enough to hold your fish. For the whole fish I used a lidded pan suitable to be used in the oven as well as the stove top, and I finished cooking the fish in the oven. You could alternatively start the sauce in a pan and then transfer it to an oven dish holding your fish to finish cooking. Heat your olive oil over a low to medium heat – you don’t want to burn either the oil or the garlic. Once warm add your chopped garlic and fresh herbs, cook until the garlic begins to change colour. Allow this to quietly simmer for 15 -20 minutes, you don’t want to boil away all the liquids, rather to bring it all together as a soupy sauce. Gently press the tomatoes to incorporate into the sauce and check your seasoning. 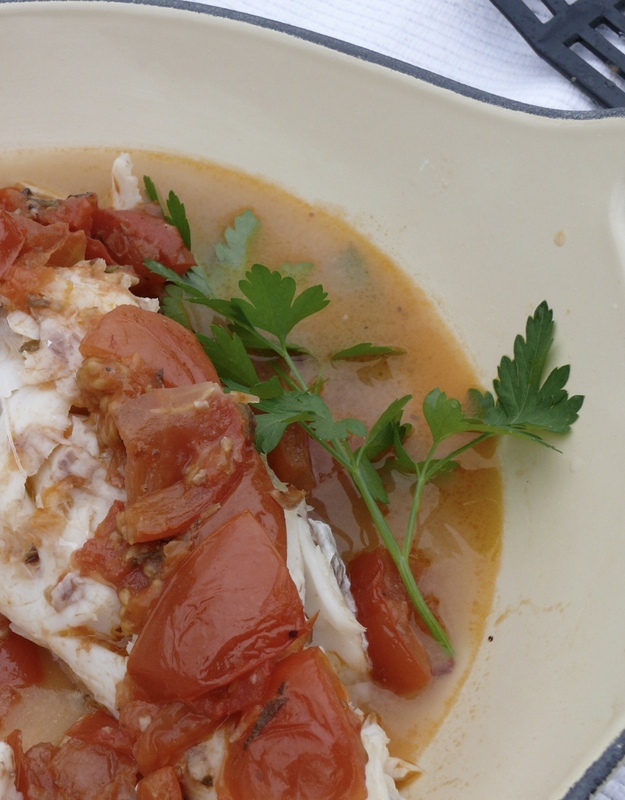 – Fish fillets can be placed on the sauce, cover the pan and cook over the same medium heat for about five minutes, depending on the thickness of your fillets, until they are just cooked. 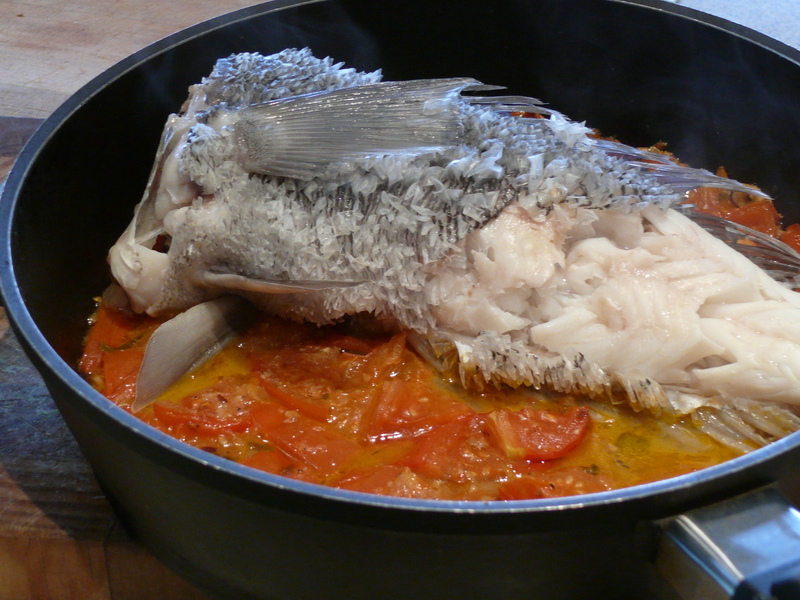 – Whole fish can be laid on top of the sauce in your pan – if it is large enough – or pour the sauce into an oven proof-dish and place the fish on top, then cover the baking vessel and cook in a medium oven for about half an hour, until the flesh has turned white right to the bone. You can check this by gently pushing a sharp knife into the thickest part and pulling a small gap to look in and see that the flesh is white all the way to the bone. Serve straight away with a drizzle of your best extra virgin olive oil, a scatter of parsley, and some baby potatoes or crusty bread. Try this at home or at the beach – imagine cooking it over an open fire on the beach – it is simple enough to do just that!